Medium or well-done? Dell also wants a part of the tablet market with the 7 inch tablet. 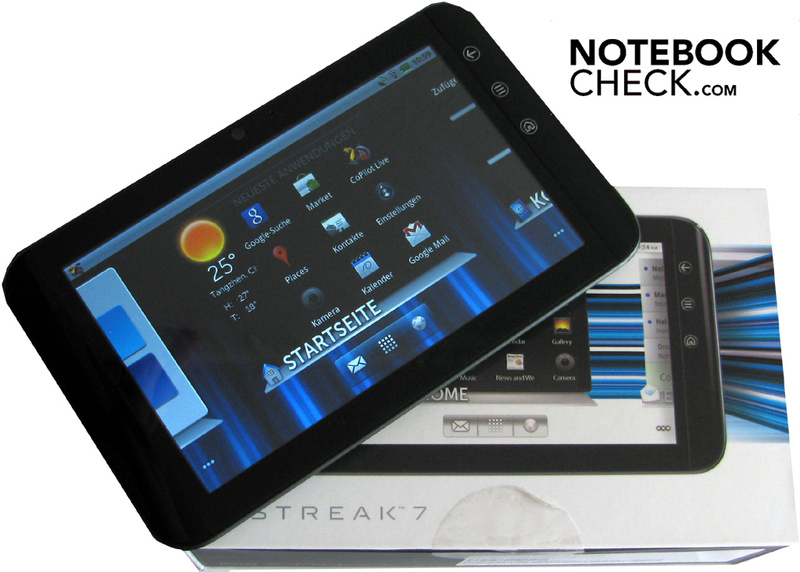 The Streak is based on the Android 2.2 operating system and is driven by a Tegra dual core processor clocked with 1 GHz. Is Dell's Streak just raw meat or well-done? Dell's second model from the tablet/MID series (previous 5" review here) has a touchscreen with a diagonal of 7 inches and is thus 2 inches bigger than in the first model. 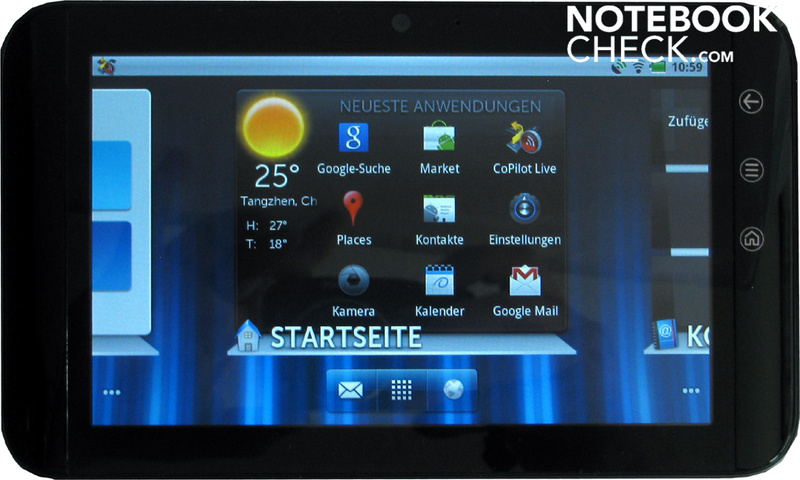 Now the Streak looks more like a tablet PC and no longer like an oversized smartphone. 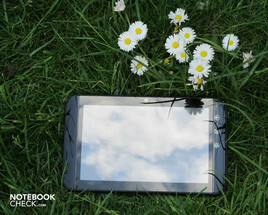 The small Web-pad has grown into a full-fledged tablet PC based on Android. 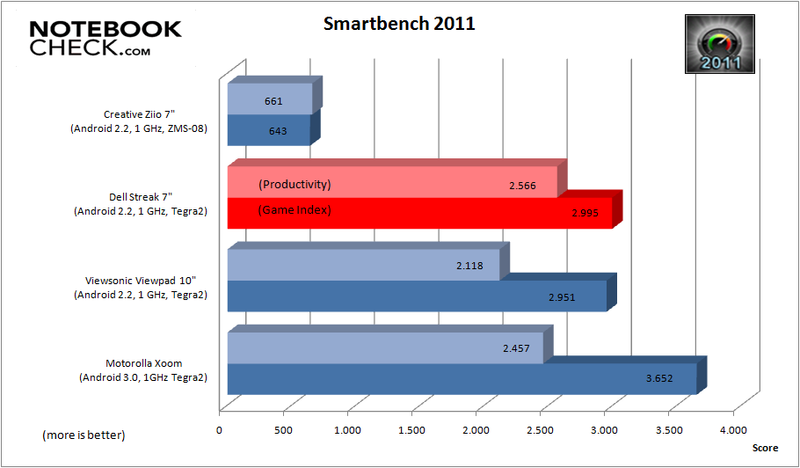 The handy little Streak runs on a dual core CPU, model Tegra2 from nVidia. The Streak is almost exclusively used via the 7 inch multi-touch display. A network connection is set up via WiFi standard IEEE 802.11 b/g/n or Bluetooth with EDR+ support. The internal memory of 16 GB can be expanded up to 80 GB by SD or SDHC memory cards. The Streak can be used as an email client, for linking to the social networks, as a full-fledged navigation system, for chatting or as a gaming platform. Snapshots or high definition videos can also be made on the move with the installed 5 megapixel HD camera. 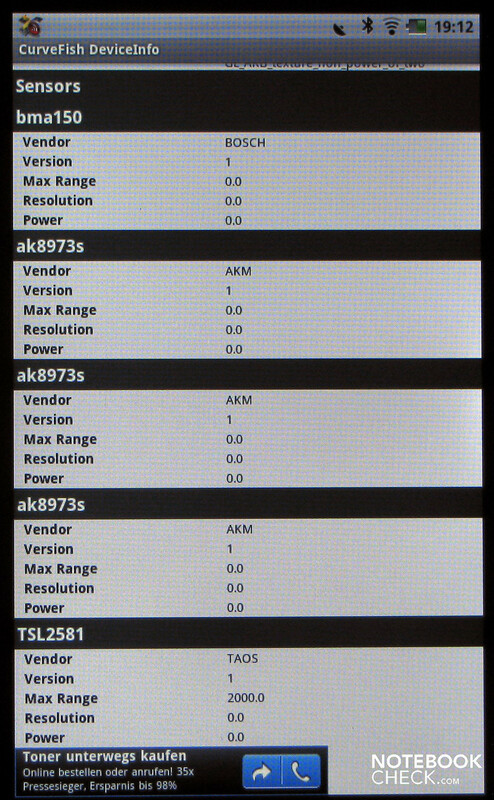 If you take a closer look at the Streak, you'll notice that there are only few interfaces and controls on the device. The 7 inch touchscreen is well-fitted into the black plastic bezel. The Streak is quite handy and has a thickness of 12.4 mm. Its width is just short of 20 cm at a height of 119.8 mm. It doesn't feel like it weighs 454 grams. You wouldn't believe that it nevertheless weighs almost one pound. 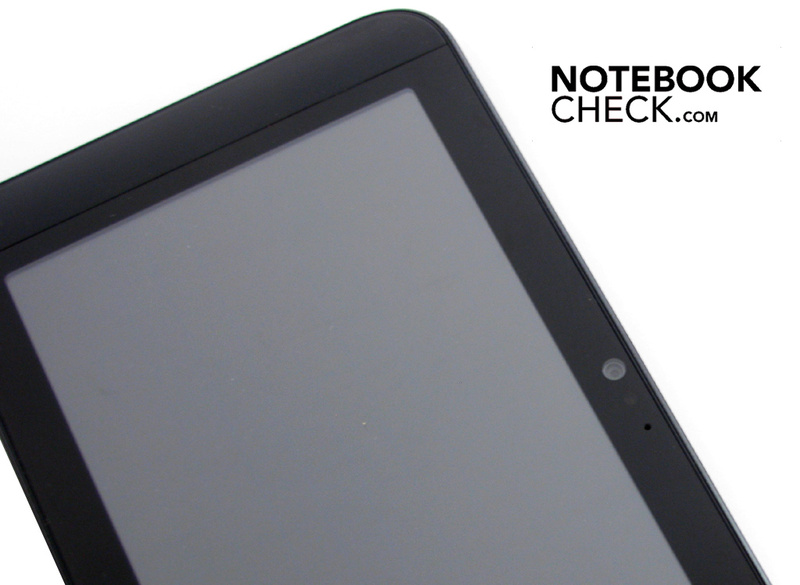 In comparison, the Galaxy Tab 7" from Samsung only weighs 380 g, the Ziio 7“ from Creative 415 grams. There is a port for a docking station on the bottom that can also be used with the included USB data and charging cable. Dell offers a matching home audio/video docking station for about 55 euros. 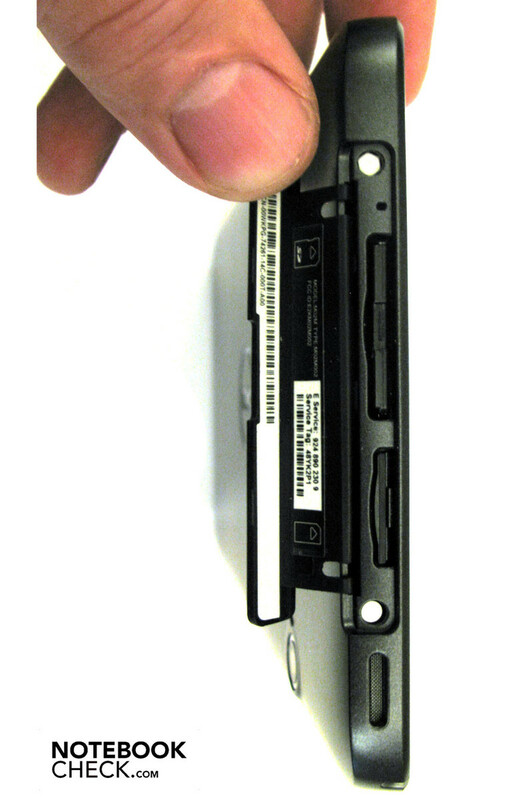 There is a SD cardreader and a non-functional SIM card slot located underneath a cover on the device's right. 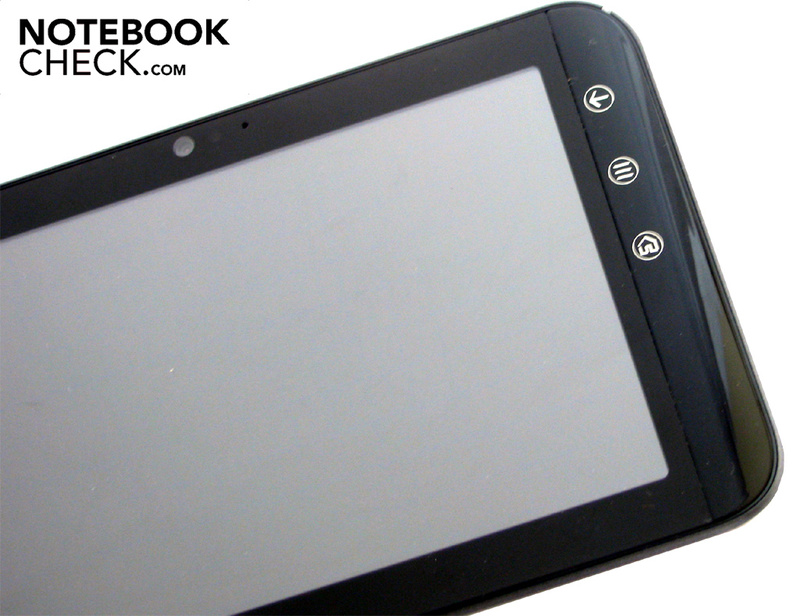 The SIM card slot is without functionality in our WiFi version of the Streak tablet. On the opposite side, so the device's left, a headphone socket (3.5 mm jack) is found. Dell has placed the on/off button and volume control on the Streak 7's top. A webcam and the microphone are located above the touchscreen's center. The Streak has two loudspeakers for sound output. They are positioned on the left and right. There is a full-fledged digicam with built-in flash and auto-focus on the flipside. In this Streak model, Dell uses Wireless LAN (WiFi) and Bluetooth for its connectivity. The wireless network and Internet connection complies with the standard IEEE 802.11 b/g/n. Bluetooth meets the V2.1+EDR specifications. Moreover, a GPS receiver is installed in the Streak that turns the Streak into a navigation device. The Streak 7 inch is standardly equipped with two cameras. 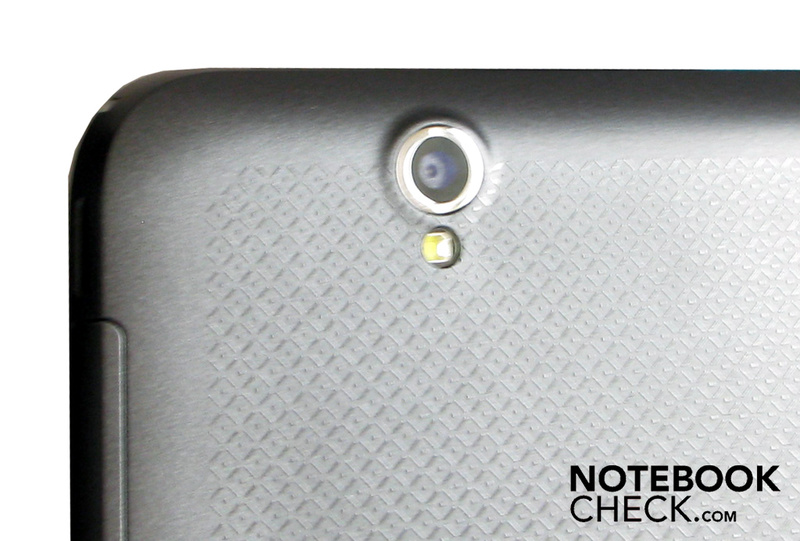 The front camera has a resolution of 1.2 megapixels and is particularly suitable for chatting, skyping or video chats. The 5 megapixel digicam on the flipside has auto-focus and a built-in flash. 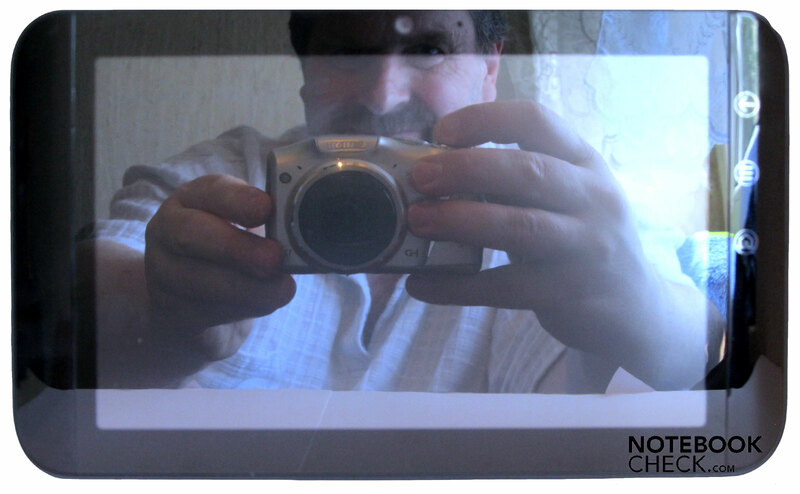 The digicam is controlled via the 7 inch screen. In addition to taking pictures, video clips can be recorded. The resolution is between QCIF (176x144) up to 720p (1280x720). 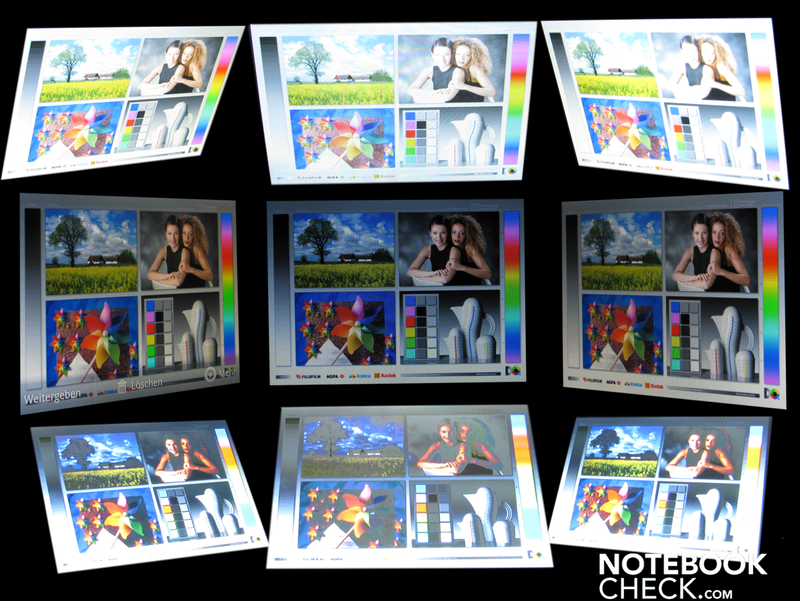 The pictures' size can be set between VGA and 5 megapixels in five steps. The videos are saved in a H.264 format with the ending .mp4. The camera's handling is easy. 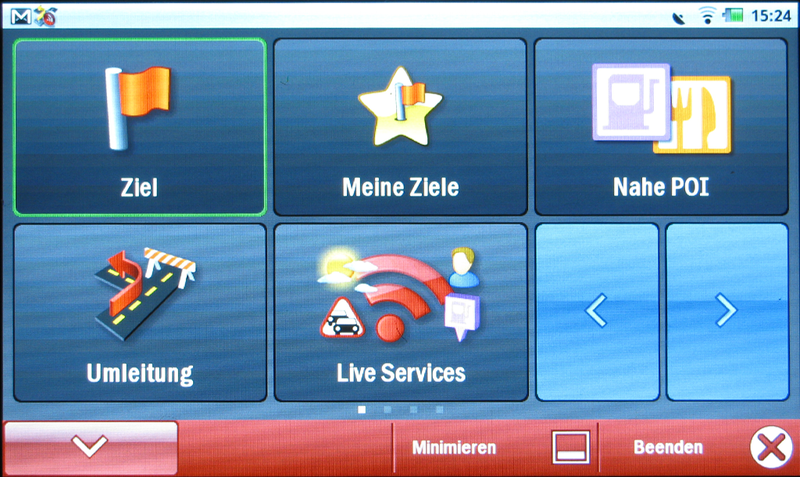 All functions are selected via the touchscreen. 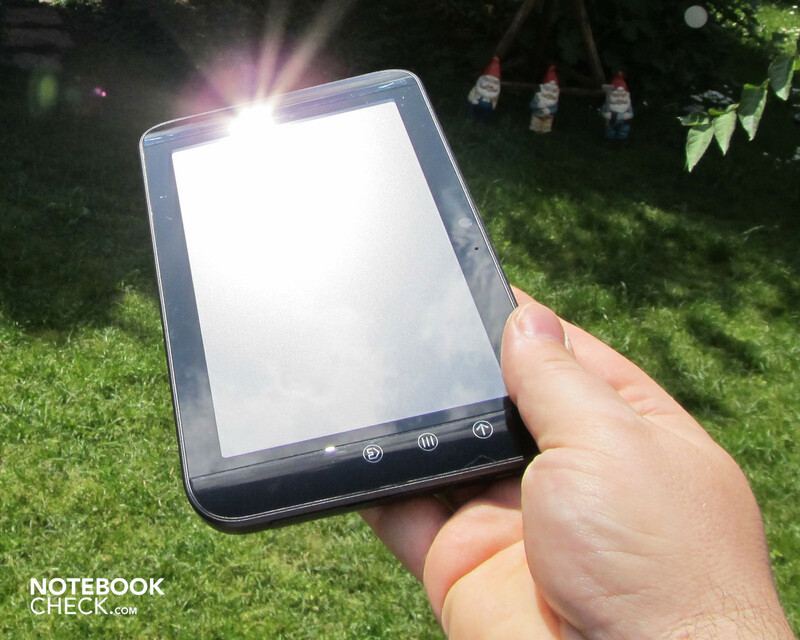 The tablet's reflective display is only very obstructing outdoors, and particularly in direct sunlight. In addition to that, we noticed that the camera's positioning hasn't been chosen wisely. When the Streak is held in both hands, the camera's lens is quickly covered by a finger. Dell could have prevented this by placing the front camera in the center. The 5 megapixel digicam also has a digital zoom. It allows you to zoom in on remote objects and works well. However, as usual for digital zoom, the picture pixelates the higher the applied zoom factor is. 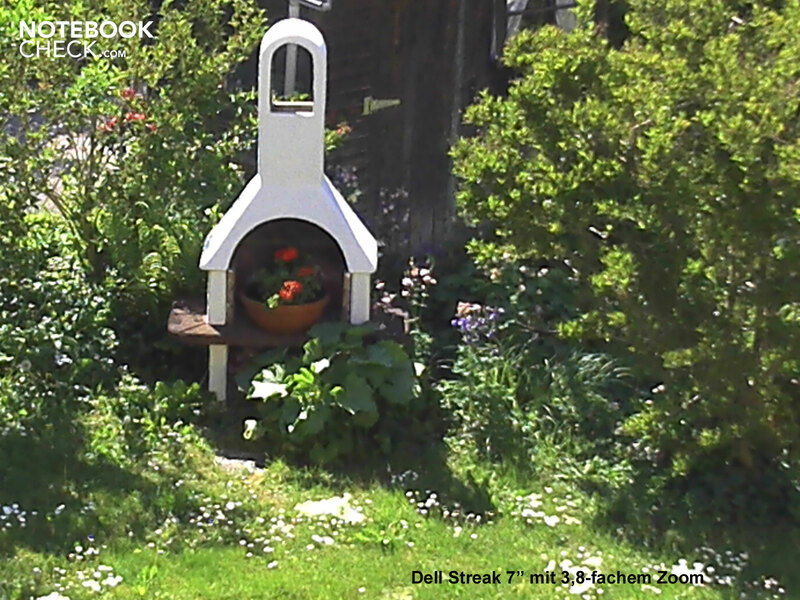 Our second test picture shows a garden without zoom. 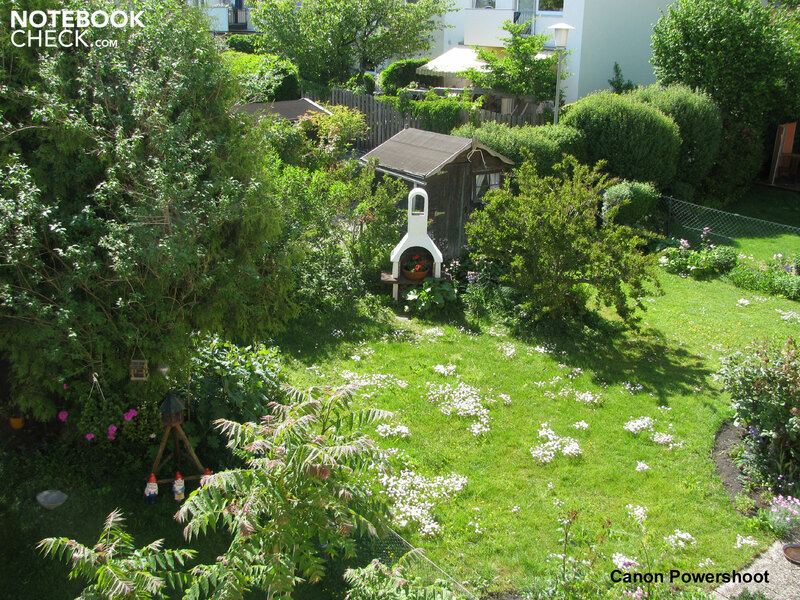 The third shows a picture with a 3.8-fold zoom and, for comparison, the same picture with a Canon PowerShoot SX110. The pictures with an average size of about 2.6 megabyte (2592x1944 pixels at 72 dpi) are saved, alike the videos, on the internal memory. Pictures can't be taken with the front camera. It is exclusively for chatting. 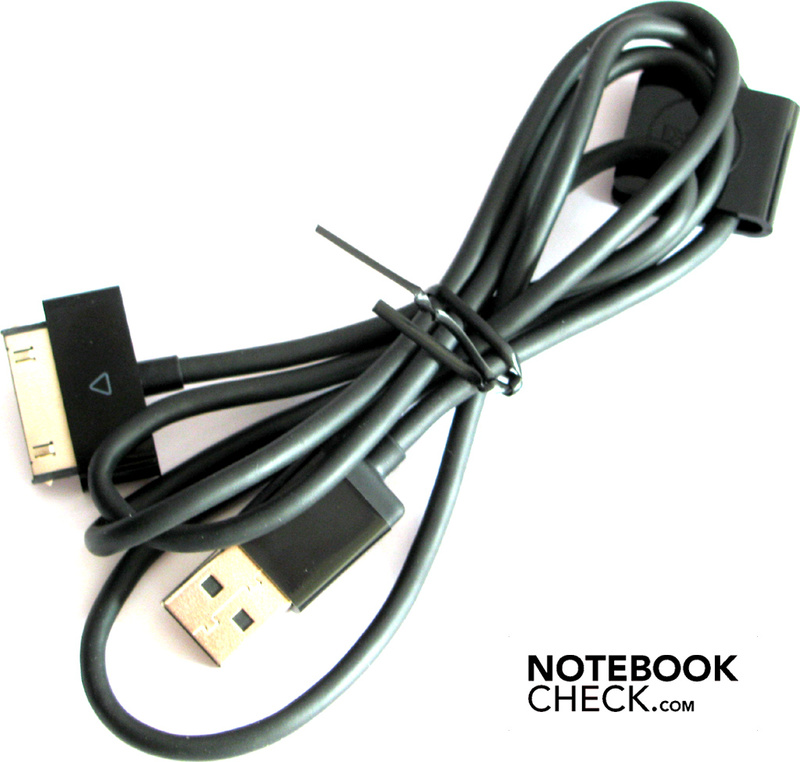 A USB data and charging cable and a matching power adapter belong to the tablet's scope of delivery. The multi-language documentation is found in a multicolored leaflet. 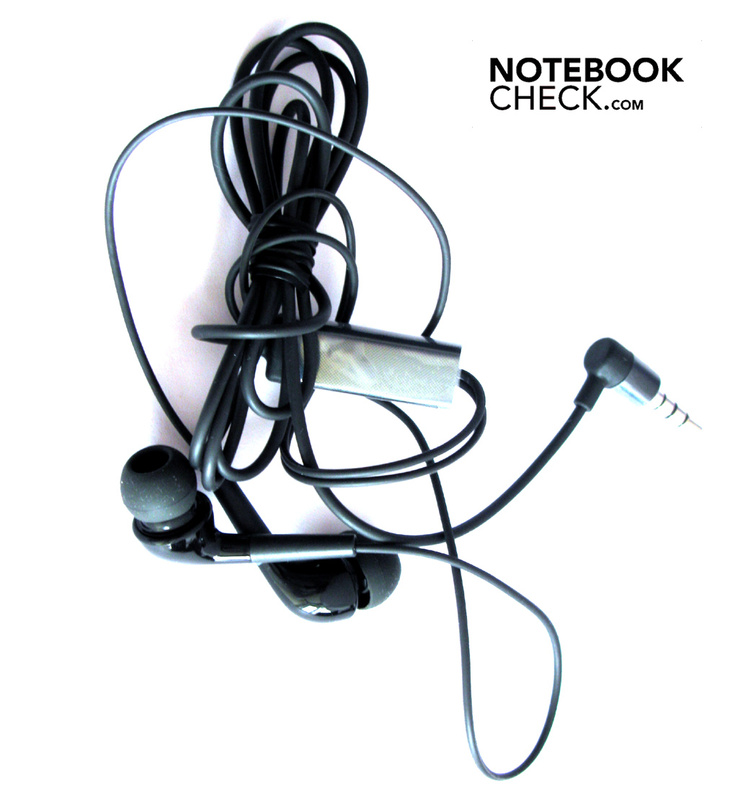 Dell also includes an in-ear headphone. The 24 month warranty is standard. All of this is delivered along with the Streak in a colorfully designed box. Dell offers additional accessories (docking station, etc.) in its online shop. 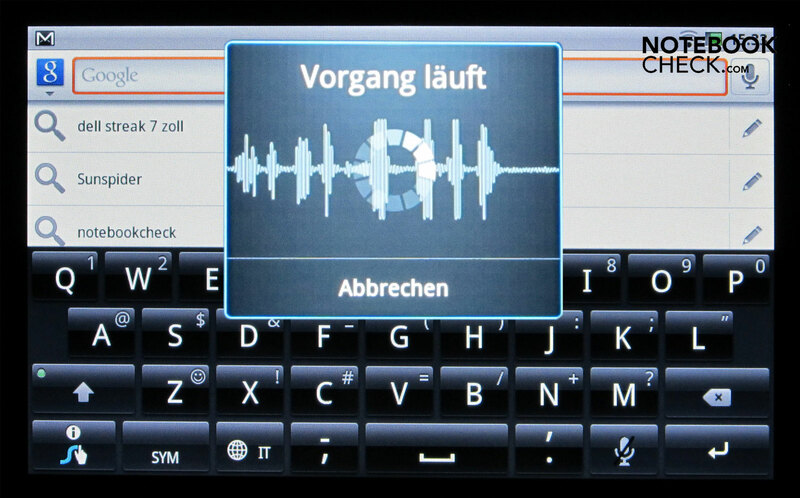 Text inputting is only possible via a virtual keyboard which is faded in depending on the application. 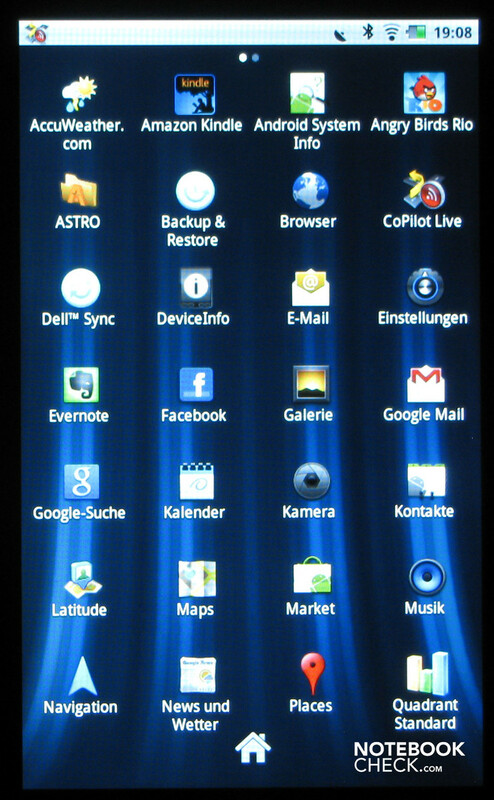 The Streak displays a QWERTZ keyboard in German apps, but without the umlauts. The keyboard switches to US, so QWERTY, in English language programs. The touched keys respond quickly, but it's inconvenient to write longer emails this way. Inputting can also be managed in swipe mode, in addition to tapping single virtual keys. This means, the finger remains on the screen and only has to stop for a moment at the required letter. Inputting is even faster via speech recognition. The spoken word is identified by the webcam's microphone and analyzed. 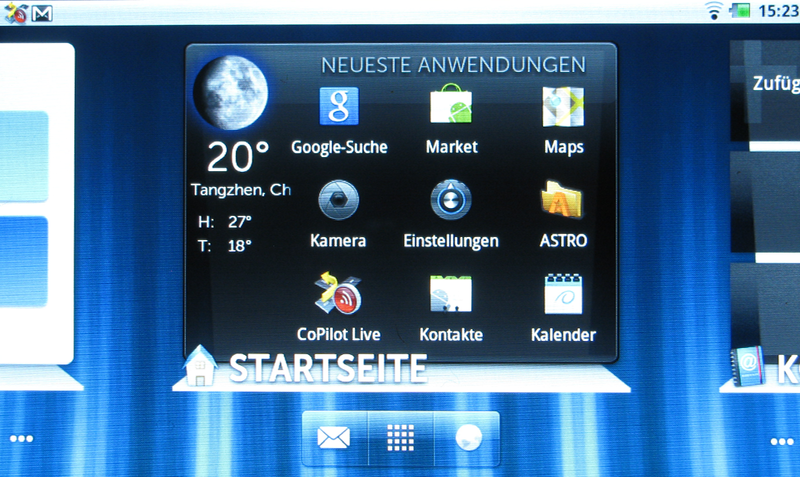 Then suggestions are shown on the display. The recognition worked very precisely in the test. Even complete sentences, including punctuation, were properly identified. Speech recognition also works with the Web browser and with Google. The term to be searched for or the website that is to be visited is entered including dot and TLD. A suggestion is displayed within seconds. An acceleration and tilt sensor is installed into the Streak. The screen's content responds quickly to the tablet's position. A few games use this technology to navigate the character through the single levels. The rotating of content on the screen can also be disabled in the settings. 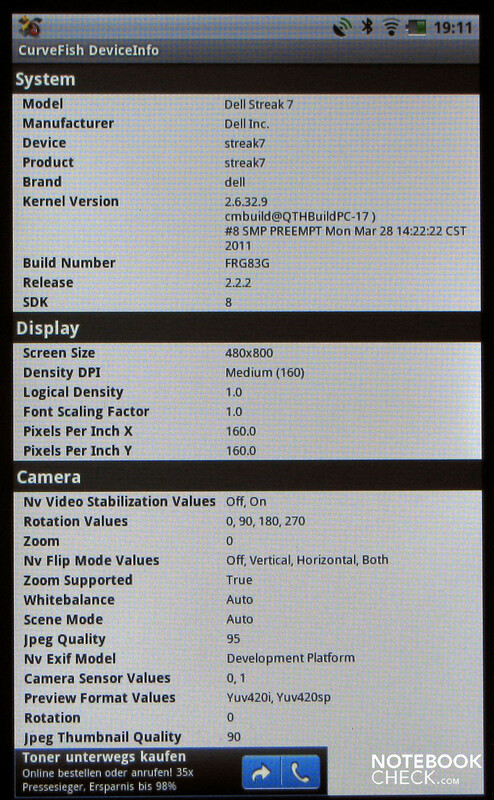 The 7 inch display has a resolution of 800x480 pixels in a 16:9 aspect ratio. 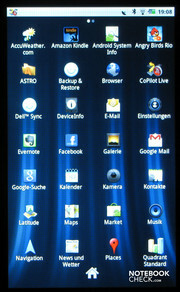 The capacitive display's surface is touch-sensitive and also supports multi-touch gestures depending on the application. 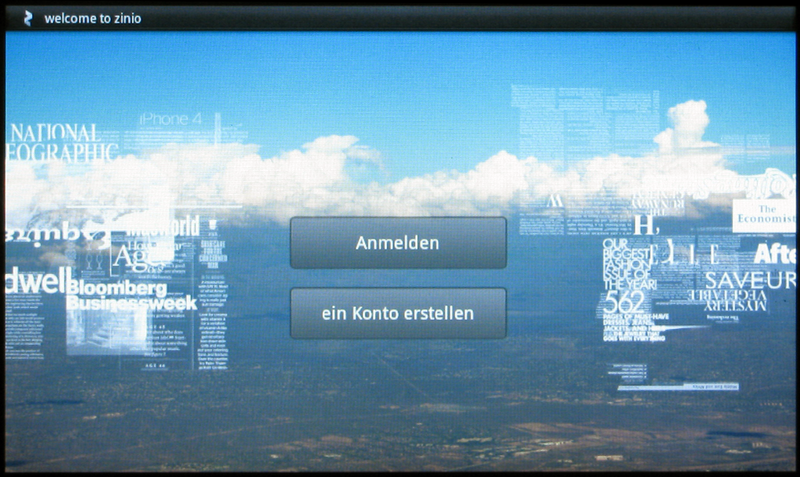 The displayed content rotates depending on the tablet's position. However, not all apps support this function. The brightness and the reproduced colors subjectively look very pleasant. We could measure the maximum brightness of 309 cd/m2 in the lower center area. The brightness decreases a bit towards the top right corner. The illumination is very good with 91%. 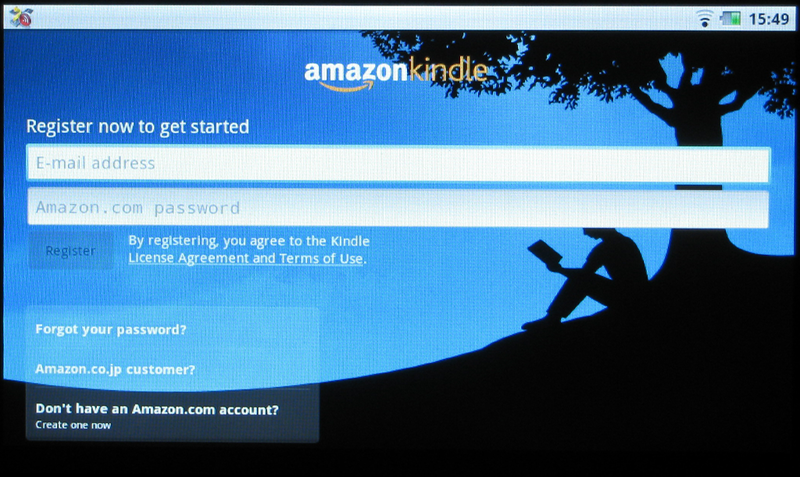 The installed display can still supply an average of 299.1 cd/m2. We record a black value of 0.42 candela per square meter (brightness unit). Thus, the screen achieves a great maximum contrast ratio of 717:1 in the display's center. 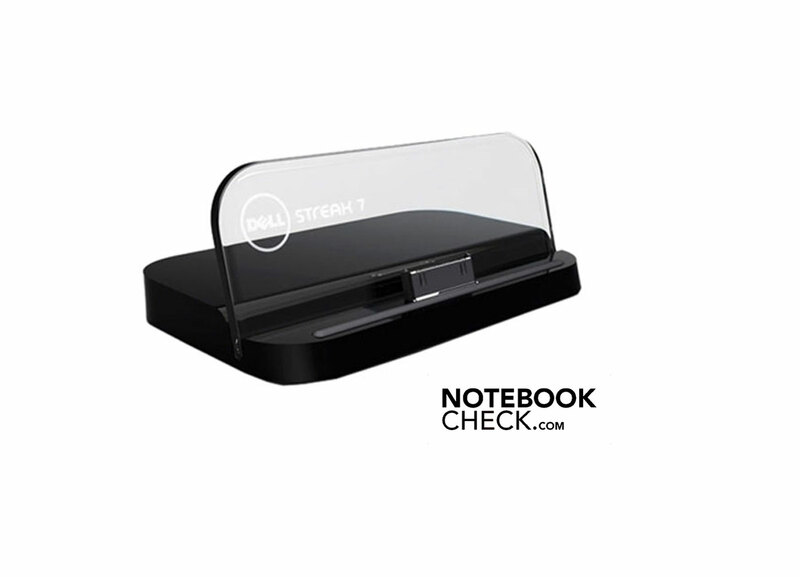 The Streak would also be the perfect companion for surfing, as an email client or multimedia player outdoors. That is, if it weren't for the reflective display. Everything in your surrounding is mirrored. You won't see anything on the screen when you're sitting in the beer garden and the sun is shining upon you. 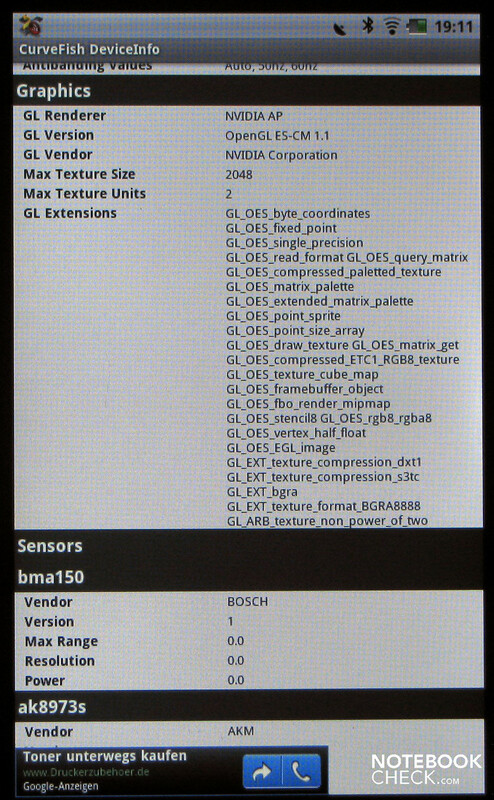 The settings in display brightness are of no help, either. The viewing angles on the screen's content varies depending on the Streak's position. However, we are pleased to say that even angles up to 45 degrees don't falsify the picture. The picture merely changes its usual colors and inverts quickly when the device is tilted towards the back. The picture brightens up when it's tilted towards the front. On the other hand, the Streak's display is forgiving when it's turned vertically. This allows even several people to follow the display's content. Alas, if it weren't for the glossy display. 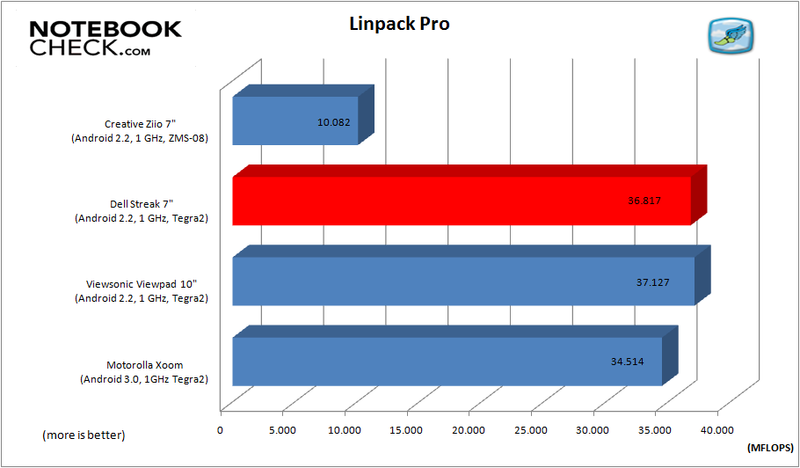 Current tablets with IPS display technology have a clear advantage in this point. 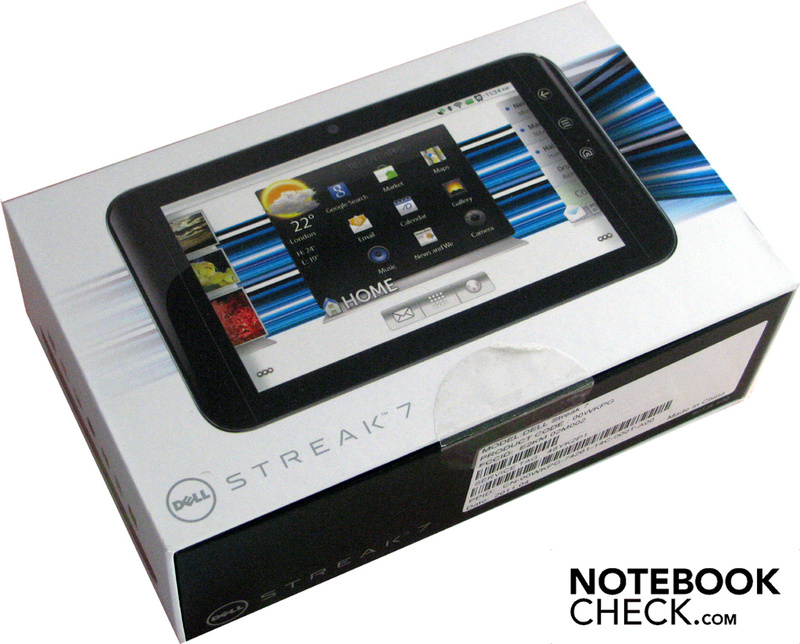 Viewing angles: Dell Streak 7"
A Tegra2 processor from Nvidia does its job inside the Streak. This dual core ARM Cortex A9 CPU is clocked with one GHz and has a 2 level cache of 1 MB. The processor model is practically the non-plus-ultra for tablet PCs at the moment. 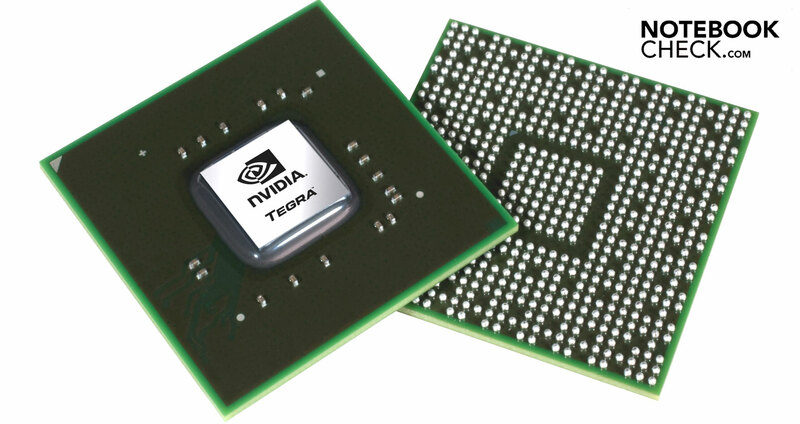 Thus, the Tegra2 is found in many models – but not only in tablet PCs. 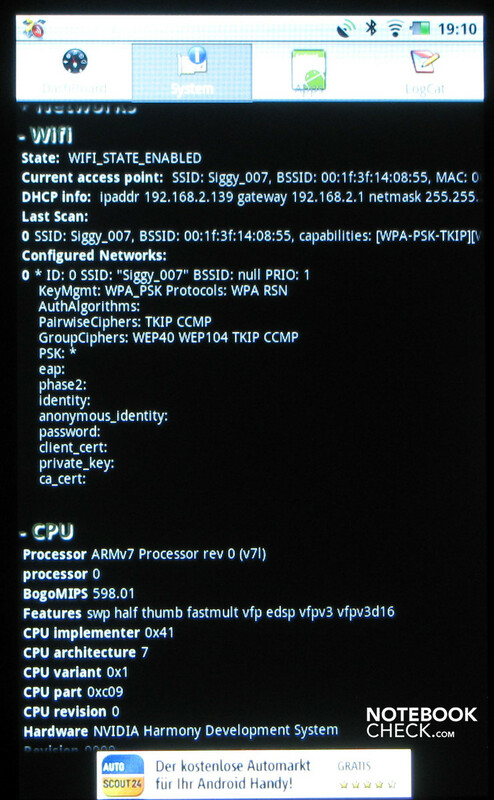 The Tegra2 is also found in smartphones or netbooks. System information: Dell Streak 7"
In addition to the CPU, the GPU is also located on the die. The nVidia GeForce graphics processor (ultra low power) ensures fast rendering on the screen. The symbiosis of CPU and GPU is also responsible for rendering multimedia content. 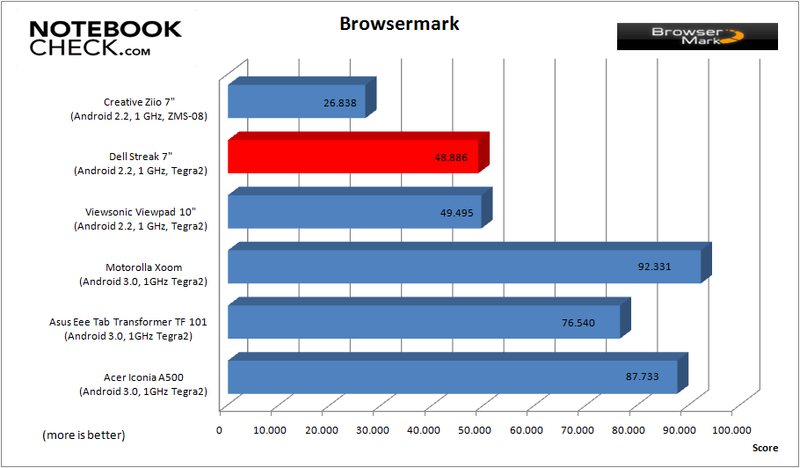 HD videos up to 1080p can be played smoothly with the Tegra2. Formats like H.264, MPEG2/4, DivX 4/5 and XviD HT are supported. Regrettably, the Streak doesn't have a HDMI out, although the Tegra2 processor would be capable of this according to nVidia's specifications and from experience with other tablet PCs with this ARM solution. You will ultimately find a solution in the accessories: The available docking station for about 60 euros can transmit a 1080p signal via HDMI port. 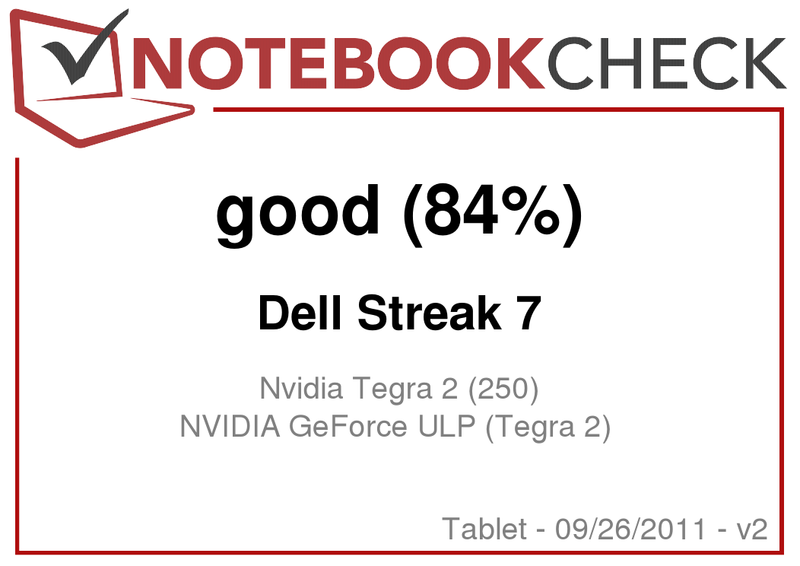 Dell has done a good job with installing the hardware into the Streak 7 inch – although the Tegra2 still massively struggles with Android 2.2, and first can really be able to use its potential with Android 3.0. 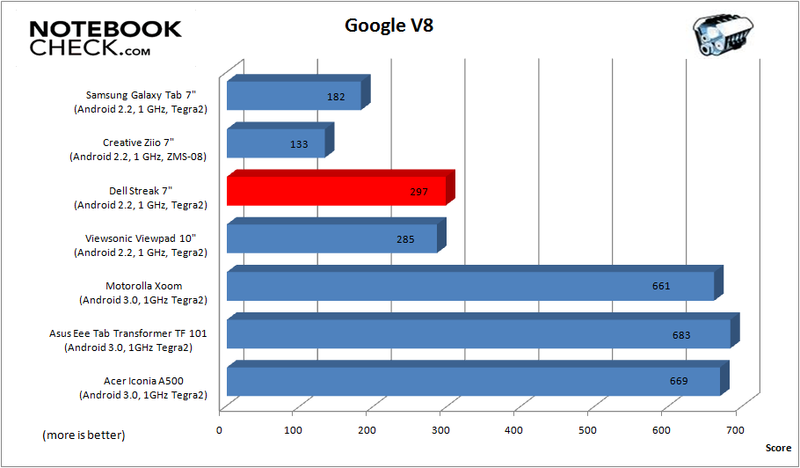 The Tegra2 can first show how well it really works with Android 3 (see benchmark comparison data). When we compare the benchmark results with other Android tablet PCs, we see that the Streak from Dell clearly has the lead among the 7 inch devices. Unfortunately, we don't have all benchmark results of "older" 7 inch devices because these benchmarks weren't available at the time of the tests. The comparison to the latest 10 inch devices, such as the Asus Eee Tab Transformer TF 101 or Motorola Xoom WiFi/UMTS, show that a clear increase in performance can be expected with the same processor model and the new Android 3.0 operating system. Many applications are installed in the Streak's state of delivery. They can be expanded at any time via the AppStore. Dell has installed the following among others: Google Maps, Android Market (AppStore), CoPilot Live (navigation software), Google Mail, Zinio Reader, QuickOffice, YouTube Viewer, RSS Feed Reader, TuneIn Radio. A file manager is not installed, among other programs. It has to be downloaded from the AppStore should it be needed. A PDF reader is also missing on the Streak. 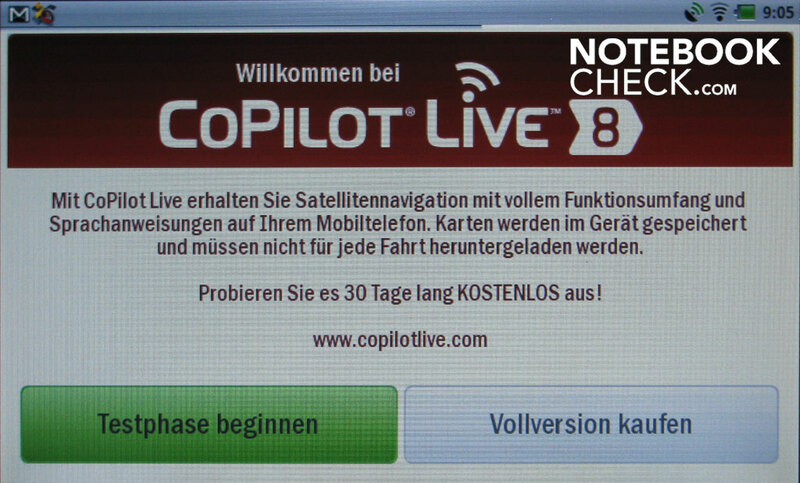 The Streak mutates into a full-fledged navigation system with CoPilot Live. 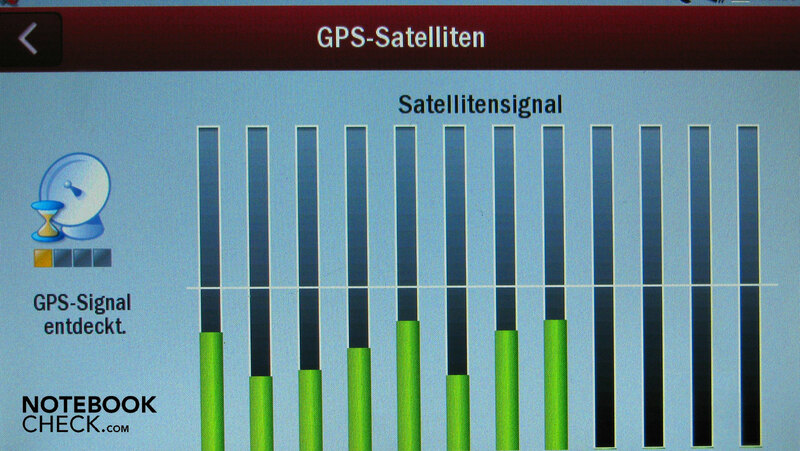 The built-in GPS receiver uses up to 12 GPS satellite signals. The maps have to first be loaded before initial use. This app can be used up to 30 days after registering for free and has to be purchased afterwards. Many of the apps that are installed on the Streak have to be linked to a Google account before use, though. 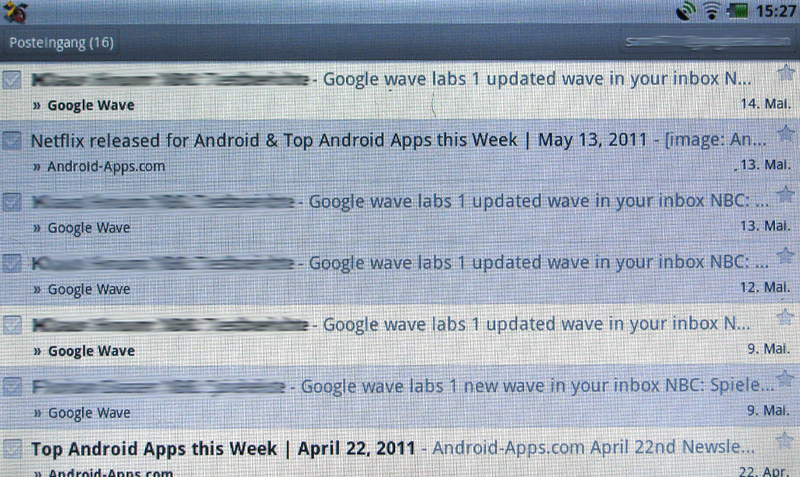 One thing that we noticed unfavorably is that the apps don't identify each other when you've signed up at Google. Every application runs through a separate registration. 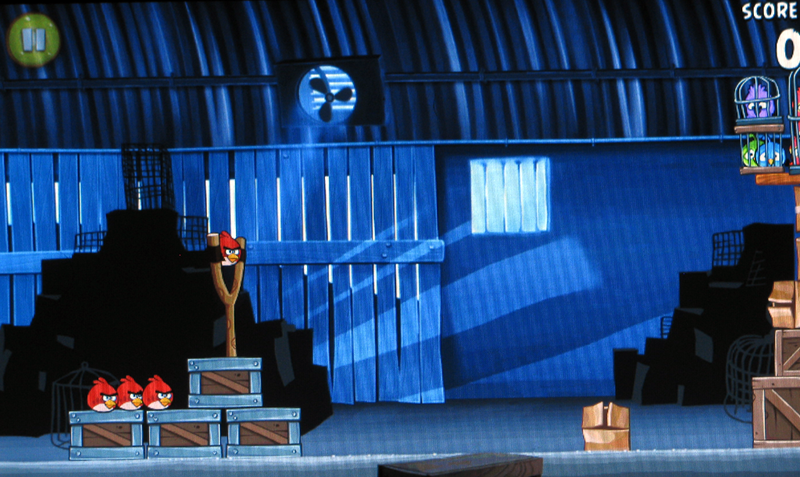 Games like Angry Birds Rio, Fruit Slice or Light Racer 3D (Tron version) run very smoothly. The number of HD games for Android is constantly increasing. 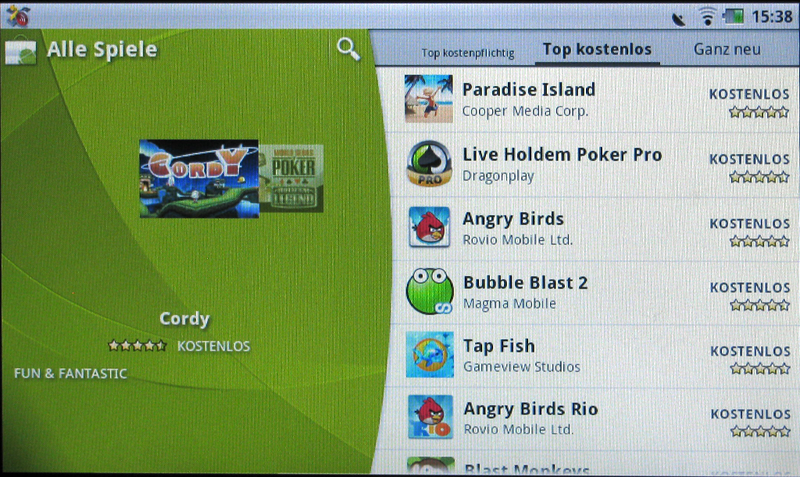 Many are also offered as shareware or trial version in various AppStores for Android tablets. The compatibility is very high. We hardly found a game that didn't run in the various tests with the Android 2.x tablet. The resolution was partly not rendered correctly because the games are still optimally sized for smartphones. However, this will soon change. Since the Streak doesn't have a fan and as good as no moveable parts, there isn't any noise to be measured. And anyway, it would be too bad if an annoying fan were built into such a small tablet. A Flash memory with a capacity of 16 GB is installed into the Streak, instead of a hard disk. It works like a solid state drive (SSD) without rotation noises or the typical write / read behavior of a hard disk. 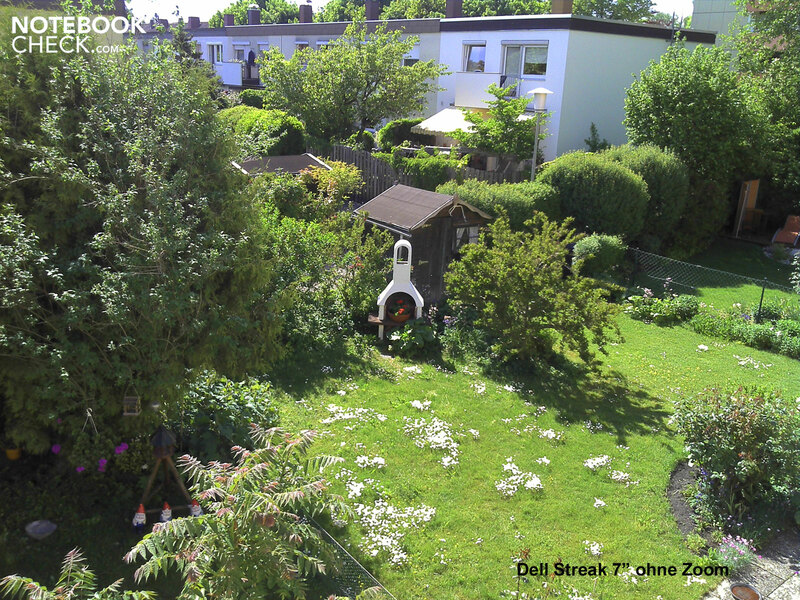 Dell's Streak also shows itself from its best side in terms of temperature. The case only gets slightly warmer during load than in idle mode. 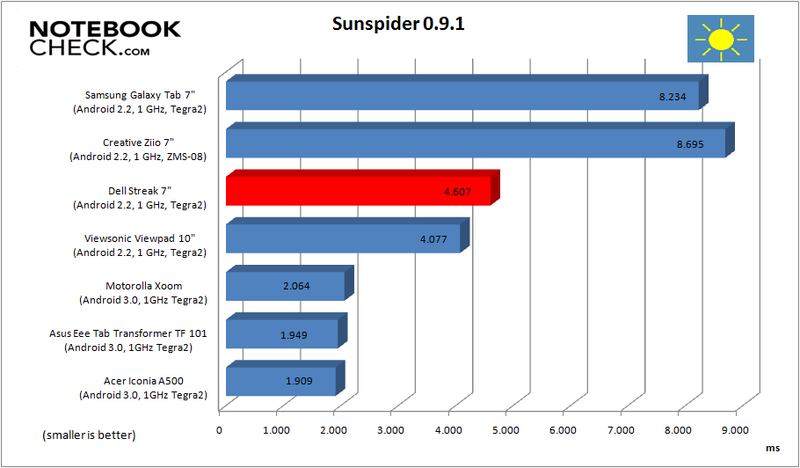 In the following chart, it can clearly be seen where the Tegra2 CPU is hidden in the case. It gets warmer than the other hardware that is installed. The temperatures climb by 5 degrees Celsius. The power adapter only gets slightly warmer while charging than when the Streak's battery is charged via the USB charging cable. (+) The average temperature for the upper side under maximal load is 27 °C / 81 F, compared to the average of 30.7 °C / 87 F for the devices in the class Tablet. (+) The maximum temperature on the upper side is 32.6 °C / 91 F, compared to the average of 34.8 °C / 95 F, ranging from 22.2 to 51.8 °C for the class Tablet. The Streak has two speakers on the case's left and right for sound output. The quality is surprisingly good. Both speakers aren't driven into clipping even when the volume is turned up to full. 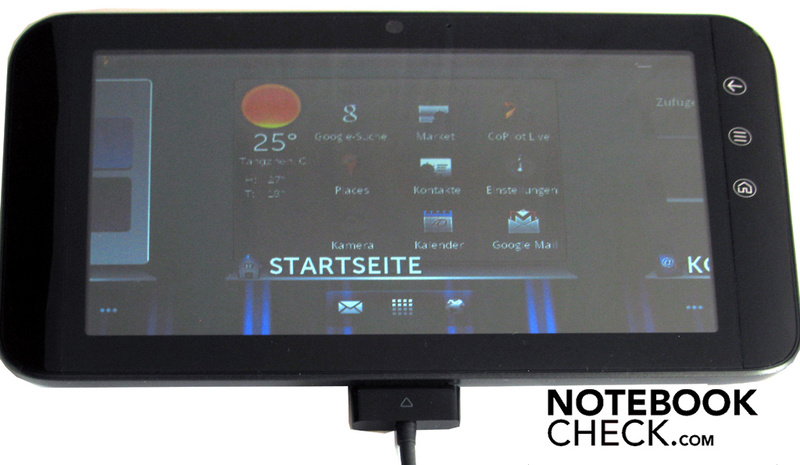 The volume can either be set directly by the rocker switch on the tablet's top, or via the configuration menu. You can be on the move for a long time with the Streak without having to look for a power source. The battery lasts for good 7 hours in idle mode and with disabled GPS / WLAN and Bluetooth. You can even watch an overlength movie without having to fear that the battery gives up beforehand. The HD movie can have a length of 240 minutes. The Streak needs a power outlet sooner when the GPS receiver is enabled. The battery is drained even faster when the WiFi function is enabled. 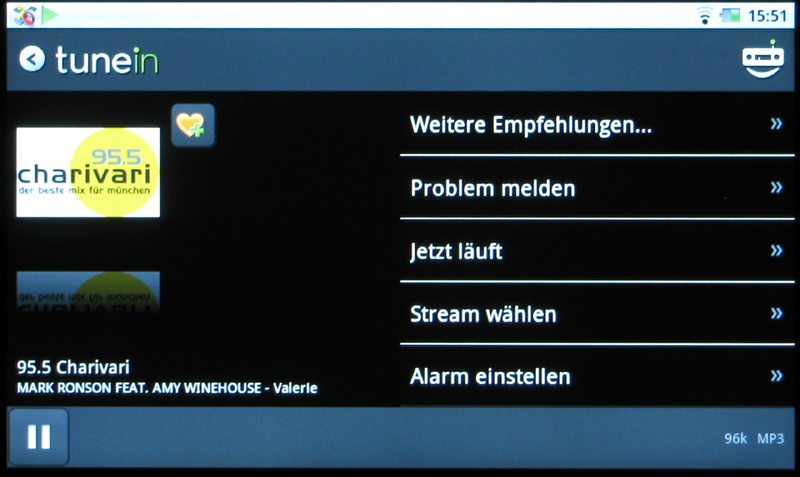 The system notifies you after 185 minutes and demands a power source via a warning and acoustic signal. It's too bad that the Streak's USB data cable can only be used as a charging cable when it's connected to the Streak's charging adapter. A USB port on the notebook or PC doesn't work. The Streak's aggressive energy saving function is interesting. The Streak disables all WiFi connections when the display automatically turns off after a predetermined time in order extend the battery runtime. This can be disabled in the settings, though. Another possibility to save battery capacity is to disable the WLAN connection within a freely selectable time slot. You should turn off the Streak completely when it's no longer needed on the move. That is more effective than any energy saving measure. We measured the power consumption via the tablet PC's charging adapter. The graph shows that the charging adapter still drains a bit of power from the outlet even when the Streak is turned off or fully charged. The Streak consumes power even when it isn't connected to the charging adapter. 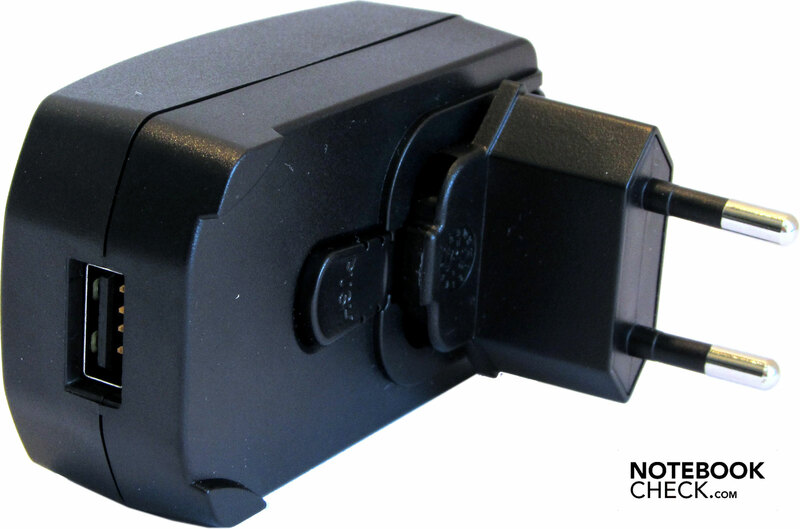 Tip: Pull out the adapter from the outlet after charging the Streak. That not only saves money but also spares the adapter. The Streak makes a very good impression in the test. However, if the Streak will sell is another story. For one thing, the market is already fairly saturated with 7" models. For another, the more attractive successor model with a 10 inch display diagonal and Android 3.0 is to be put up for sale shortly, if we can rely on rumors. 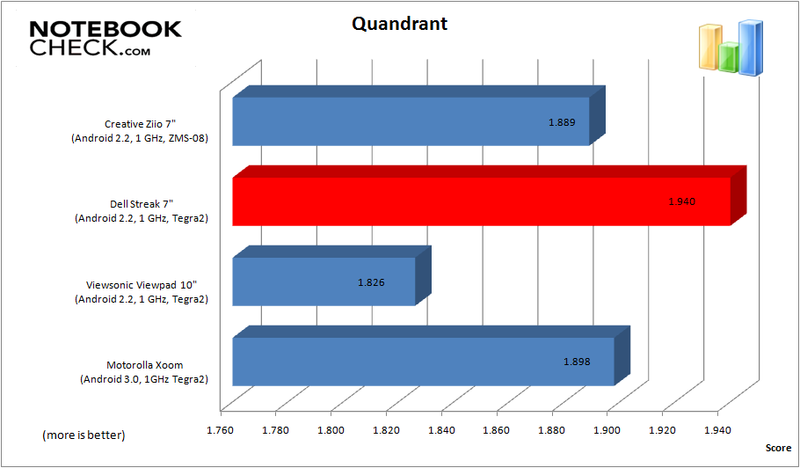 The performance and test rates are currently the best in the 7 inch sector. None of the previously tested competition models comes even close to the Streak's benchmark rates. The Streak's value is increased by the numerous pre-installed apps, the installed GPS receiver and the 5 megapixel digicam. The latter allows making viable snapshots and HD videos. 350 euros are still a lot of money even when these three functions are added up (tablet PC, digicam and navigation system). Comparable devices partly cost a lot less. However, they can't reach the Streak's performance. 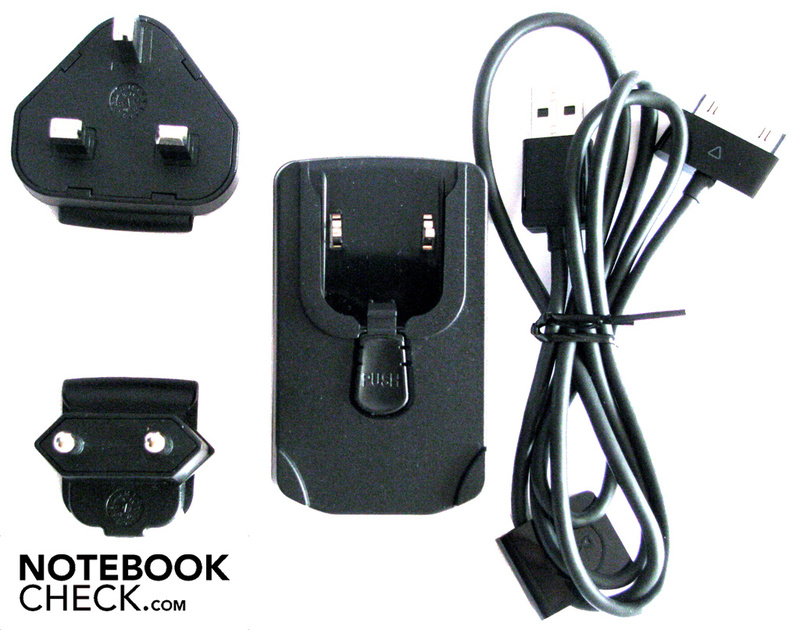 In Review: Dell Streak 7"
A webcam and microphone are found above the display. The navigation software can regrettably only be used for 30 days. The Streak can also be used as a navigation system. The last opened apps are listed on the start screen. Dell also offers a docking station for the Streak for about 55 euros. The charging cable is inserted on the devices bottom. USB data and charging cable. 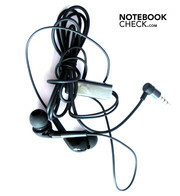 An in-ear headphone is also a part of scope of delivery. Built-in 5 MP digicam with auto-focus and flash. The SD card is found on the side. Controls for back, extras and home. Dell's tablet is very handy with its small size. The Streak can also be used as a full-fledged navigation system due to the installed GPS receiver. Dell also offers matching car accessories. Two applications that other manufactures always standardly install: First a task manager and second, a file manager. These first have to be downloaded from an AppStore. 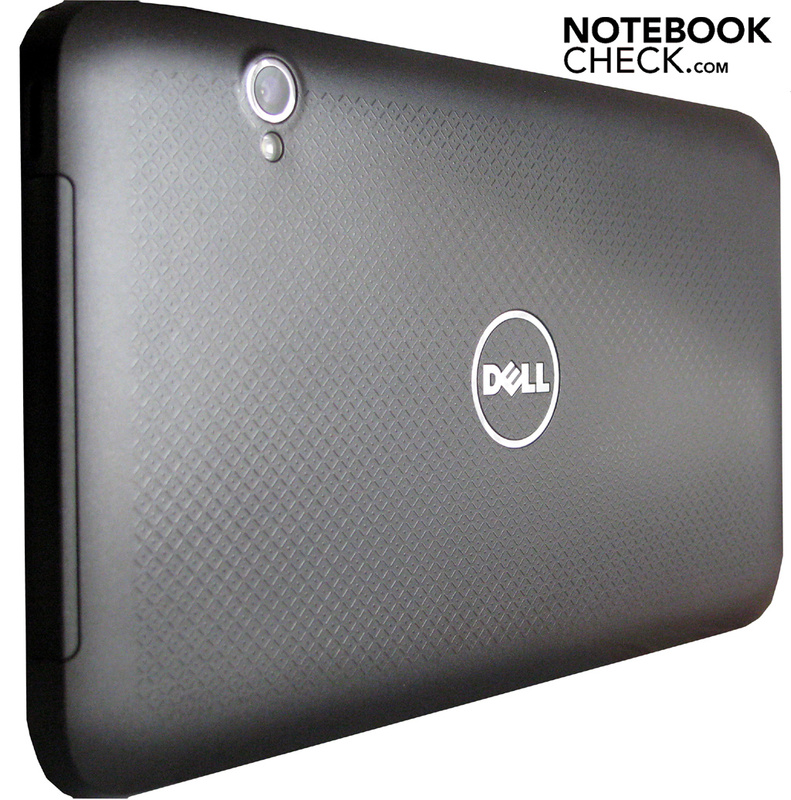 Dell's Streak tablet is very fast thanks to the 1 GB Tegra2 CPU. All games run as smooth as silk, movies are rendered smoothly up to Full HD (1080p). The competition in the 7 inch market sector is very high, but until now none of the tested 7 inch devices could hold a candle to the Streak.